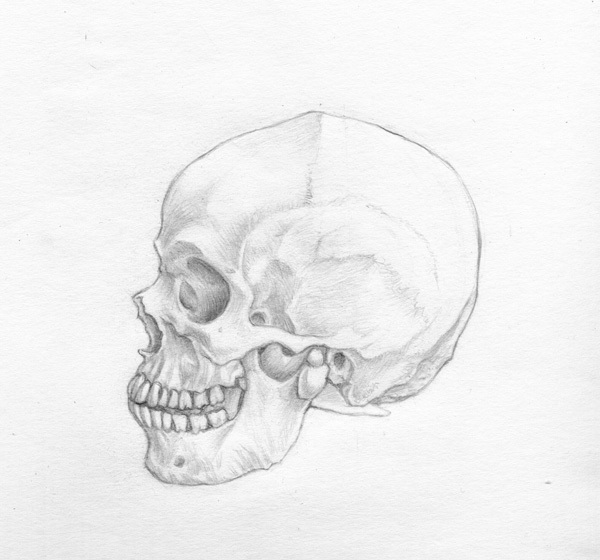 Yesterday I finally got around to making use of the skull I bought a short while ago and I decided to begin with a lateral view study. I used a mechanical HB pencil of which I'm not accustomed for my drawings (except when drafting), often preferring to use a combination of woodless pencils instead. It allowed me to get in some fine detail that I may not have been able to achieve with a typical graphite pencil but the work was slower and the drawback was not being able to get in the level of blacks I would have liked. In the future, I would use a paper with a smaller tooth because this paper wore down more easily.